One of the determining factors of any vehicle build is space and weight. What you decide to modify in your rig after you get it from the showroom floor is going to hugely impact how you go about saving on space and weight, as most people know you can't exceed the Gross Vehicle Mass (GVM) and especially the Gross Combination Mass (GCM) if you wish to tow. Some vehicle modifications are unavoidable, especially where safety and comfort are involved, but there are some things you can do to ensure you are maximising the space and weight in your vehicle. With Adventure Curated's recent build of their 76 series, they are all too familiar in saving on weight and space. Weight and space are intertwined but have the ability to impact on our travels in entirely different ways. ‘Light’ is always a relative term, but if you travel lighter your vehicle will appreciate it. Our 4WDs have far more load-bearing components than at first glance; suspension, tyres, chassis, wheel bearings, bushings, the list goes on. With every bump and corrugation, the load on these components is amplified by excess weight. Depending on the trips you like to undertake, there’s no getting around carrying certain gear. We do lots of different trips, but the most challenging, from a weight perspective, are those to remote areas. 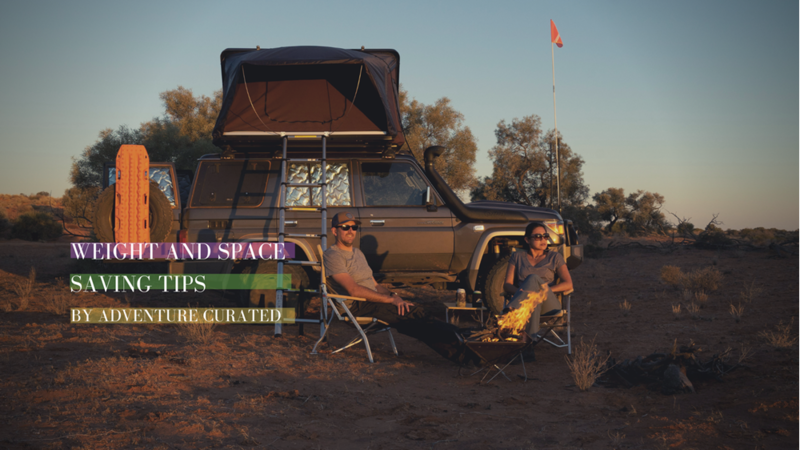 We recently set up a new LandCruiser for remote travel. We upgraded the Gross Vehicle Mass (GVM) to 3,660kg and that’s our strict upper limit for any trip. The stock vehicle, passenger, long range fuel and water weights are all relatively fixed, so it’s the build weight and gear that’s left to play with. So here are our tips. Ply drawers which are considerably lighter than steel drawers with steel runners. Save ~40kg. Heavy duty cross bar racks 20kg vs full steel rack ~60kg. Save ~40kg. Approximate savings on these items 222kg. As well as total weight, the position of weight makes a really big difference. Getting weight low and forward really helps. One of our water tanks is underbody, and between the axles, and the other is inside and forward of the axle. Our second spare goes inside and forwards of the axle, along with any heavy things like firewood when we need to collect and carry it. Vehicles with longer rear overhang need to be especially careful of weight positioning; plenty of chassis have been bent, often due to fuel and water being loaded well behind the rear axle combined with rock hard suspension. Gear is an easier place to trim kilograms. For fun camping trips there’s less fuel, water and food; so we can pack more freely. On remote trips, we are far more careful and we usually find the less we bring the better. Whilst lighter gear is harder to find, it is out there and it makes an enormous difference. From nesting pots to folding wash basins and compact storage bags, chairs and tables it’s possible to trim space and bulk from right across your packing list. The overall space savings is huge, and it makes packing and finding things a breeze. Less bulky gear is easy to pack too. If you’re on the road for a while easy packing will make a huge difference. With our build, we had two main storage goals. Firstly, everything we used regularly needed to be accessible without moving other gear. Secondly, everything had to have a place. With our rear seat out we have two cargo barriers and three simple shelves. Down goes firewood (if we’re carrying it), and other heavier gear, in the middle is our personal gear (one side is Gen’s, the other is mine) and up top goes our chairs. In the back, we have 10 totes up top all labelled. The drawers have gear like our stove and pots, solar blanket and water refill hose. Our kitchen is there too, it can be used half out for quick stops or fully out with legs for more bench space. It even folds to 1% of the full size! One gull window has our lithium battery down low, a shelf with docks for all our camera batteries and laptop and our RedVision, Manager 30 and 1500W Inverter. The other has a twin compressor and water pump down low and our tools, recovery gear, axe and saw up high. After dinner, everything goes back in its spot with ease. In the morning we simply make coffee and close the lid on the tent and go. Advances in technology these days, especially where electrical accessories are concerned make it easy to save on space and weight in this area. Lithium batteries, for example, can drastically reduce the amount of weight and space in your vehicle, being a 1/3rd of the size and weight of common lead-acid batteries. What's more, they are also more efficient, better for the environment and have a better battery life. When looking at the battery management side of things, going for a battery management system, like The Manger30 is a no-brainer being a six-in-one product. The latest is the RedVision system, which we reviewed recently. The beauty with RedVision is that it combines information and control in one place, simplifying electrical system components and rewiring. For example, our tyre compressor is mounted in the rear. Connecting this to RedVision meant we could control it over Bluetooth in the cabin using the RedVision App with no need for any extra wiring to the front or switch. Then you have great solar options too. We have a 150-watt solar blanket which packs small enough to never think twice about bringing it along and provides all the power we need to top up the batteries. Read our review here. So there you have it, 5 awesome weight and saving tips from Adventure Curated that you can hopefully use for your next build. Connect with Adventure Curated and stay up-to-date with their adventures via their Website, Facebook, Instagram and YouTube channel.